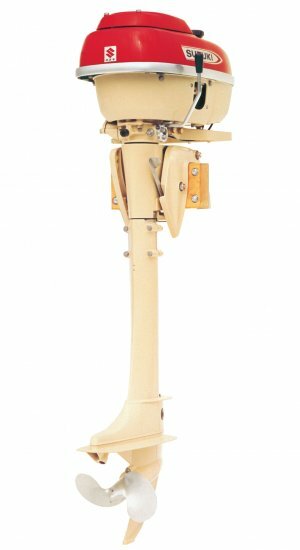 No endless rope pulling is required to fire up these portable outboards with EFI, which also offer improved economy and set a new standard for light weight. 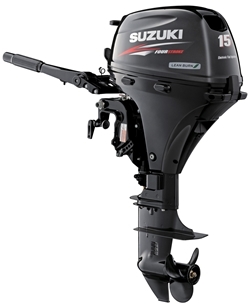 Anyone who’s ever yanked and yanked and yanked some more on the starter rope of a kicker outboard will understand why Suzuki decided to equip its new DF15A/20A models with electronic fuel injection. EFI promises to make these motors instant starters, hot or cold, in any weather. 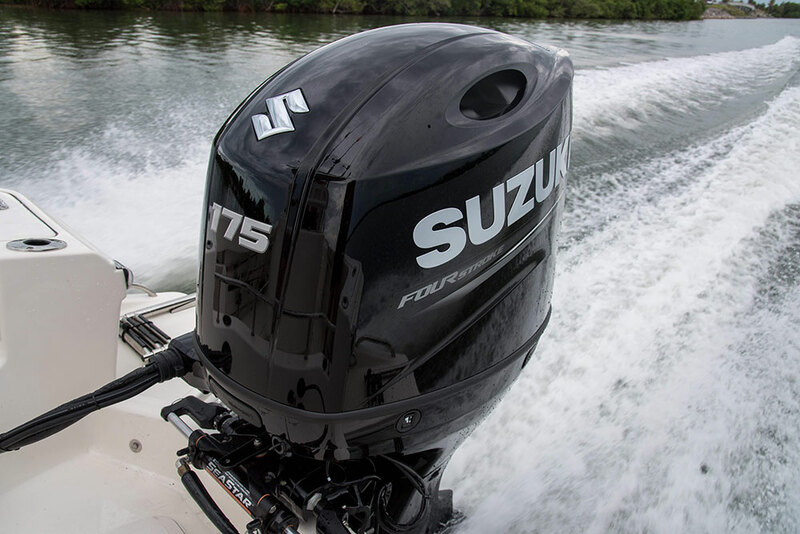 EFI has been working its way down the four-stroke outboard product tree, stopping until now with the Mercury FourStroke 25/30 , the Yamaha F40 and the Honda BF40 models. I think that product planners calculated that EFI would simply add too much cost to smaller motors, which already have a tight profit margin. The new Suzuki models have what’s called “battery-less” EFI, meaning that a battery is not required to power the system, which has an electric fuel pump and some computer controls. The Mercury FourStroke 25/30 also uses a battery-less system, but I was first exposed to this type of fuel injection in 1997 on two-stroke Arctic Cat snowmobile engines, which coincidentally were designed and manufactured by Suzuki. Because these motors do not require a battery, they remain truly portable — if you can carry 97 pounds. That’s 18 pounds less than the Mercury 15, and 14 pounds lighter than the Yamaha, which is a real achievement considering all the extra components required for the EFI system, and that this new powerhead displaces 327cc, or about 8 per cent more than the previous DF15 model. To keep the weight down, Suzuki engineers focused on miniaturising many of those parts, rather than simply using fuel injectors, for example, from a larger motor. Slimmed-down components include the high-pressure fuel pump, a fuel cooler, the vapour separator, and the throttle body. Then they made it all fit in a package that’s more compact than the motor it replaces. With fuel injection comes a small computer, and that in turn enables the fitment of a version of the Suzuki Lean Burn Control System. To improve fuel economy in the mid-range, Lean Burn leans out the air/fuel mixture to as much as 18:1 (compared to the “ideal” or stoichiometric air-fuel ratio for a gasoline engine, which is 14.6:1). At cruising speeds and light loads, the engine can tolerate running this lean, and the engine controls protect it from damage. At full throttle, the engine needs a richer mixture, in part to cool the pistons. At its peak leanness, Lean Burn produces about 14 per cent better fuel economy, according to Suzuki. Of course, you need to dial back the throttle to enjoy that savings. However, these little motors don’t burn much fuel to begin with, so I don’t think you should buy a new Suzuki with EFI just for the economy. A better reason is the easy starting. Suzuki says the crankshaft has to rotate 720 degrees for the magneto to make enough power to energize the ignition and the fuel pump, and for the ignition timing to “index,” or know the position of the pistons. In perhaps 25 tries during our demo time in Florida, a Suzuki DF15A or DF20A started for me 22 times on one good pull of the rope. If not, it always fired on the second pull. 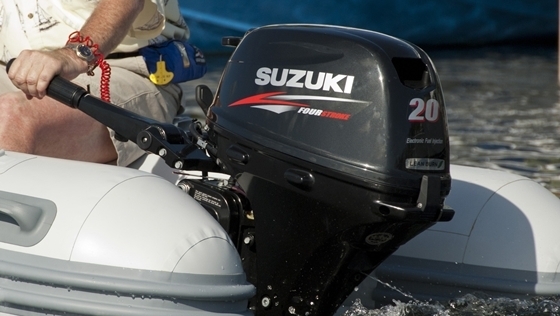 These motors also have a decompression function that reduces the effort required to pull the starter rope by 20 per cent, according to Suzuki. It took some practice for me to figure out how to engage the decompression. I found that if I bumped the rope a few times before really pulling, the effort was greatly reduced. Bad fuel is another reason to consider the EFI Suzuki kickers. 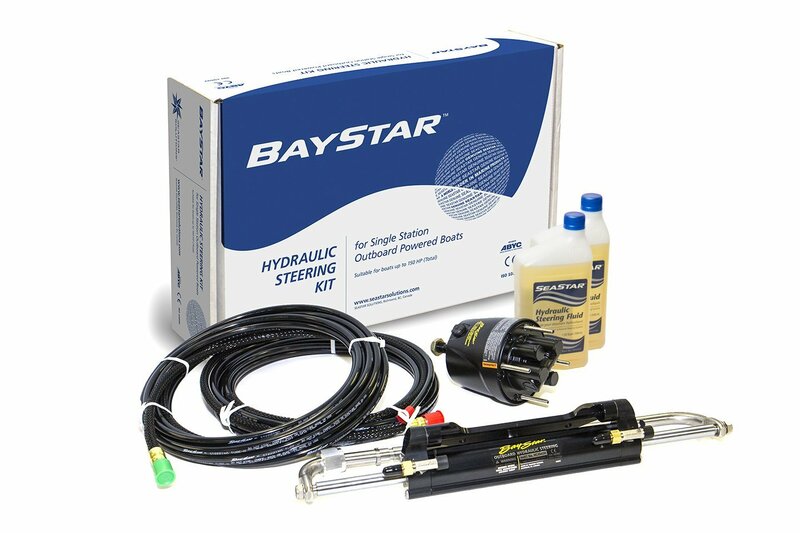 Because the EFI system is always pressurised, and the fuel is not exposed to the air, it’s much less likely that gas will go “gunky” and foul the motor, a common issue for any carbureted outboard using current fuel. 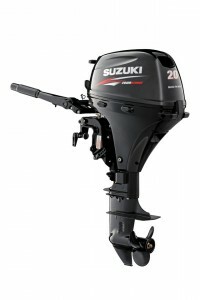 I think all motors in this size range are often inactive for long periods of time – hung on a tender, waiting for fishing season or hunting season, or parked at the cottage – which makes them especially prone to fuel-related problems. I tried the Suzuki DF20A on a Highfield CL360 aluminium-bottom RIB, and the DF15A on a SeaArk DXS 1542 DKLD, a really cool duck-hunting boat that has a 25-hp rating. Bad weather on our demo day kept me from the taking the Highfield on plane for long, but the SeaArk was up for a quick blast outside the marina, and the DF15A had no trouble planing this 15-foot aluminum boat with just me aboard. 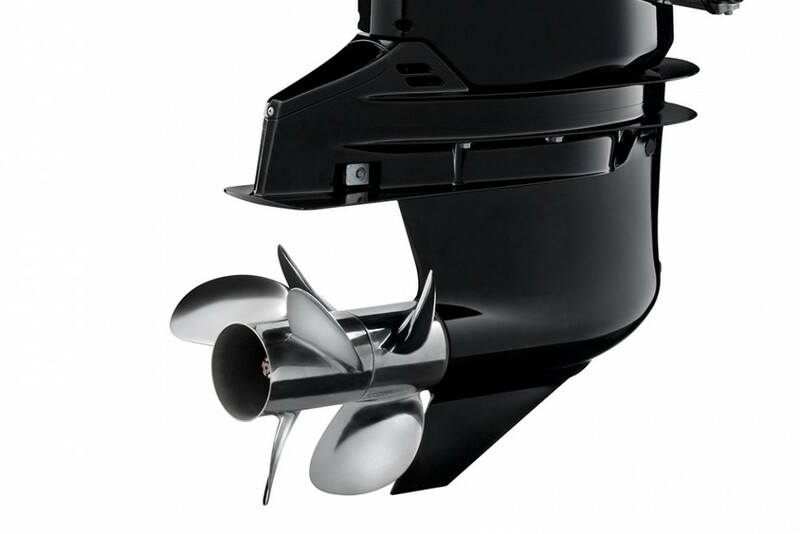 The motor is very quiet and well-isolated from the transom, passing little vibration to the boat or operator except in a narrow range just off idle. In the rain, I did note that the throttle grip seemed slick in my hand. I’d also rather have the “off” button right under my thumb on the end of the tiller, but Mercury must have the patent on that. Time will tell if this EFI system is durable and trouble-free, but if it is, I think these new Suzuki models set a new benchmark for convenience in the kicker category. 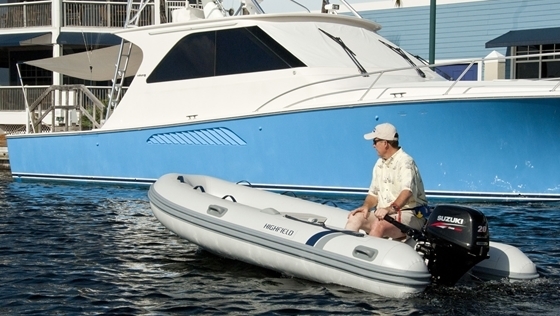 Both models are offered in a 15- or 20-inch length, and electric starting is an option. They only come with a tiller, but a remote-control kit is available. The motors should be available at Suzuki dealers right now. 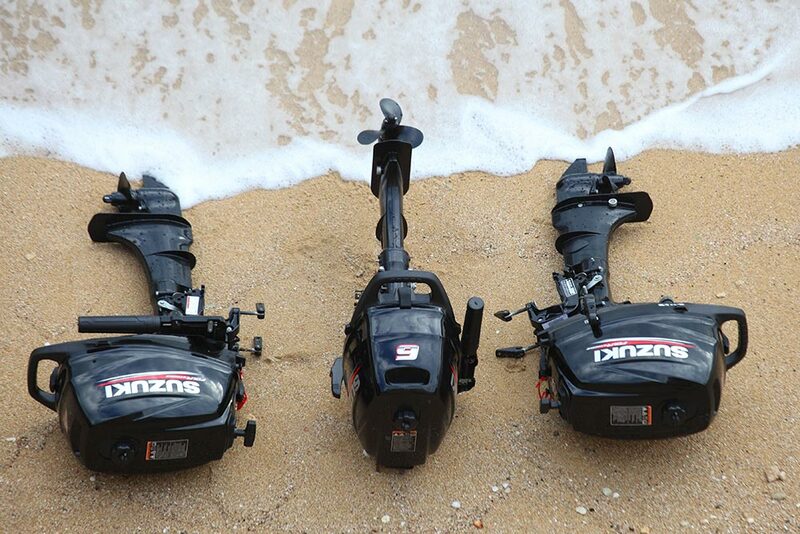 For more information on these engines, visit Suzuki Marine. 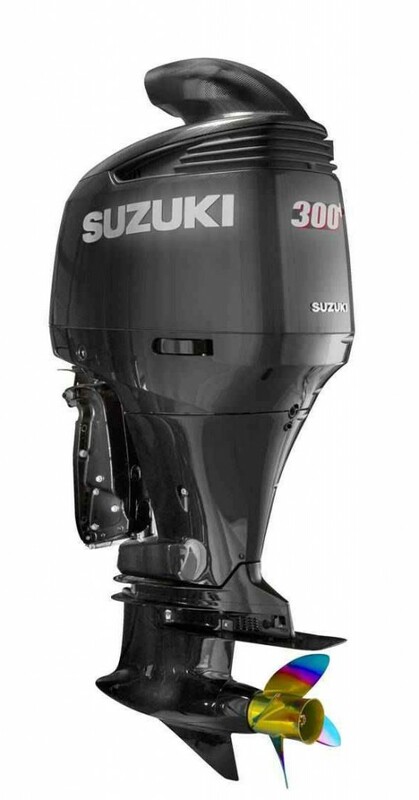 For my post on the range of Suzuki’s new offerings, see Suzuki Unveils New Outboard Models.